In the modern world, where Islamophobia is a very real and sad occurrence, some unknown bag manufacturers (and comedy geniuses) have produced a hilarious shoulder-bag with a very relevant point. So here it is. 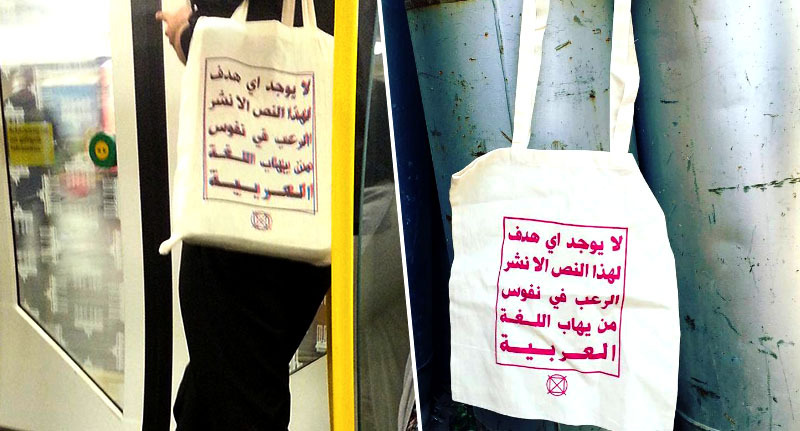 A plain bag covered in the Arabic language. Personally, I can’t read Arabic, but when a friend of mine told me what the message is it’s both comical, yet a sad reminder of the times. This text has no other purpose than to terrify those who are afraid of the Arabic language. The post went viral incredibly quickly after journalist, Nader Al-Sarras, spotted someone on the Berlin U-Bahn sporting one of the bags and took to Facebook to say so. As you can probably work out for yourselves, the joke plays on the fact that a lot of people become alarmingly uncomfortable whenever they see something written in Arabic. I know where I’ll be getting my next bag from.